This is a great example of how easy it is to create playful spaces, especially temporary ones, which can in many ways add to the fun. Also a good reminder that PARKing Day is happening in the US next week! Working in the harsh sunlight, they set about disassembling the carts. The shell of the bee became a series of green mounds, while the elephant trunk revealed itself as a slide. In a matter of minutes a playground was born, and the sounds of children playing rippled across the plaza. By most urban timelines, El Alto itself is a pop-up construction of sorts. The grid that spreads across the barren altiplano was a tiny informal settlement, perched above La Paz, in the early 1950s. Following its establishment as an independent municipality in 1985, its population jumped, by 54 percent from 2000 to 2010 alone. 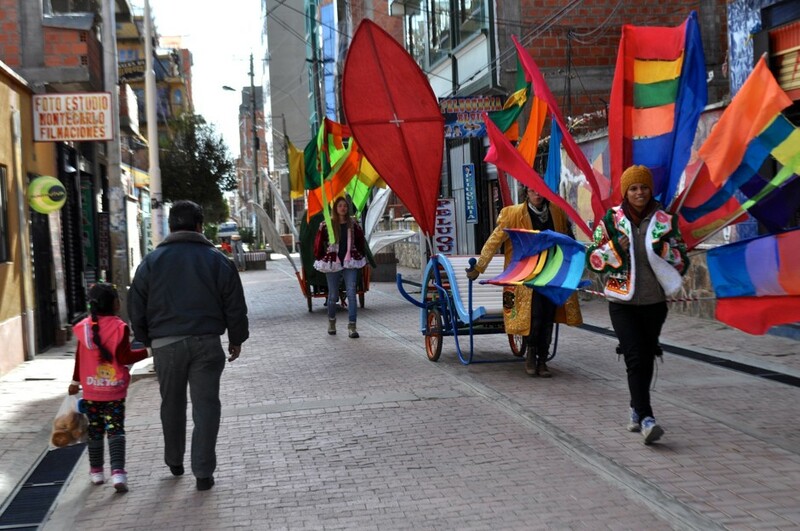 El Alto now has more than 1 million people, approximately 75 percent of whom identify as members of the indigenous Aymara people. (In Bolivia overall, 25 percent of the population is indigenous.) It has even given rise to a bold new architecture, evidence of Bolivia’s recent economic boom. In this dense city, driven by commerce at all scales, streets, sidewalks, and communal spaces are often transformed into informal markets, where vendors and minibuses compete for real estate. While this competition brings vitality, it requires novel methods of occupying urban space for play. The pop-up playground aims to do just that. Over three summers, the International Design Clinic (IDC), a “guerrilla design” collective, has collaborated with Teatro Trono to design and build a pair of mutable, movable playspaces that will help the organization expand its activism into El Alto’s public space. The areas currently designated for children in El Alto are scant and often ill-maintained.